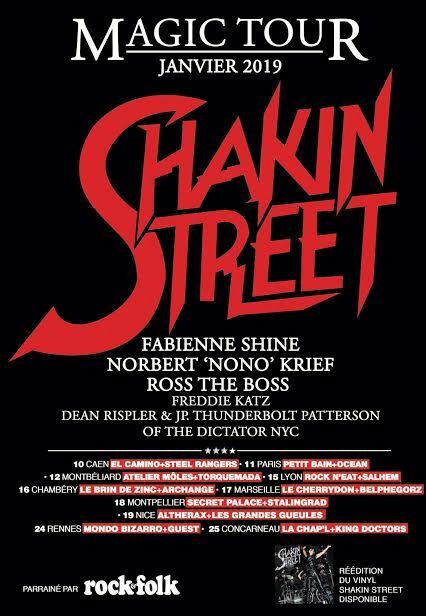 Shakin’ Street will do 11 live dates in France and NYC in mid-January 2019 as a French-American Supergroup. This lineup features Fabienne Shine, Norbert Nono Krief (Trust) and NYC musicians Ross The Boss, Freddie Katz, and Dean Rispler & JP Thunderbolt Patterson of The Dictators NYC. came together as a result of long time friendships. Check the tour dates page for the full list of upcoming shows.